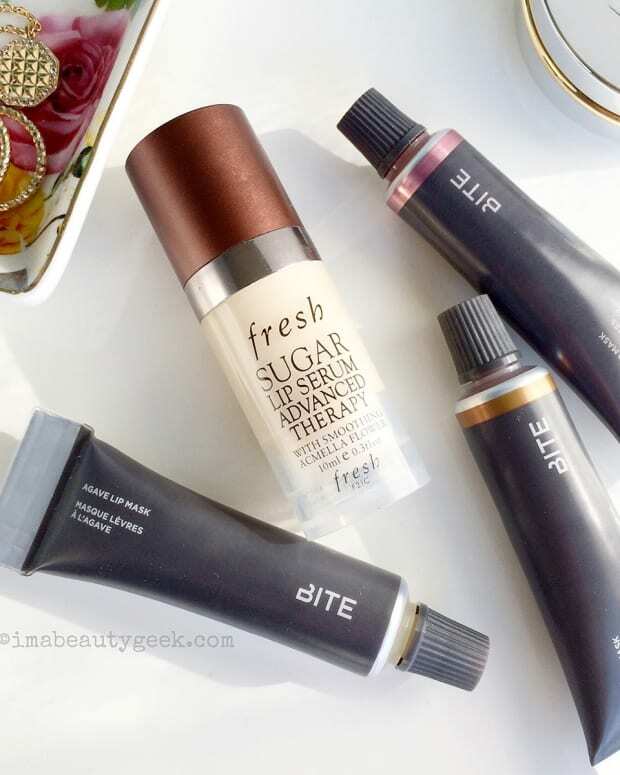 Salves that protect your lips from UV radiation and your budget from blowing up. 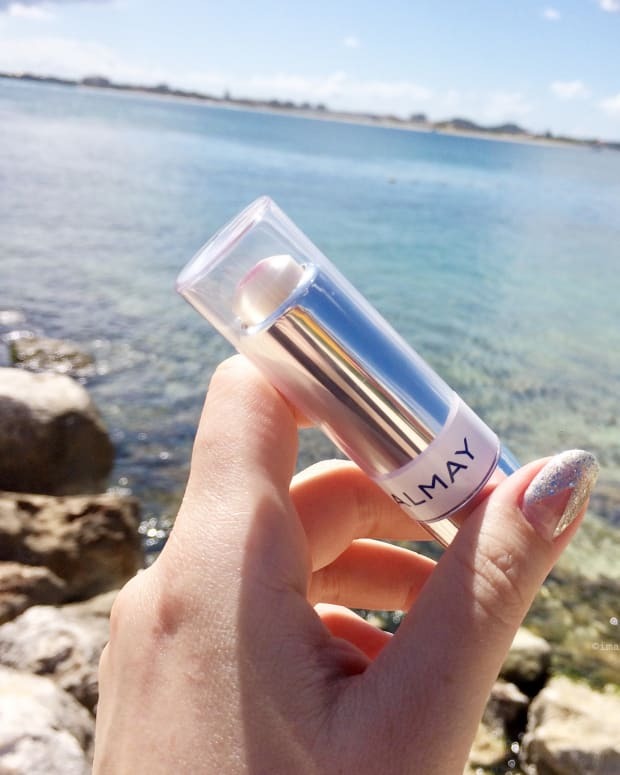 Since our last chat on SPF 30 lip balms, I&apos;ve found a few more high-spf lip-savers you might want to consider if you&apos;re planning some sunny days out. I know I seem obsessed with SPF this season in particular. That&apos;s because I&apos;ve spent more time in the sun over the last three weeks than probably any summer in the last I-don&apos;t-know-how-many years. I was in St. Maarten with family (if you follow my personal account on Instagram, you probably know that and are heartily sick of knowing – *sheepish grin*). Only three days of those weeks were actual days at the beach, but still: my usual m.o. is to avoid sun exposure entirely whenever possible. I do not like strong direct sunlight on my skin. You know that heat you feel when you put a tray of cookie dough in the oven? That intense bake is what I feel on my skin in warm-weather sun. Uncomfortable. Obviously, I&apos;m also interested in dodging for the rest of my life sunburn on my lips. Those who know, know. I found this Banana Boat SPF 45 Lip Balm for $3.40 USd at a tiny grocery shop in Cupecoy near the place I was staying in St. Maarten. It seems widely available there; I spotted it at a number of places, including the beach gift shop on Pinel Island (it&apos;s $5-something USd there). 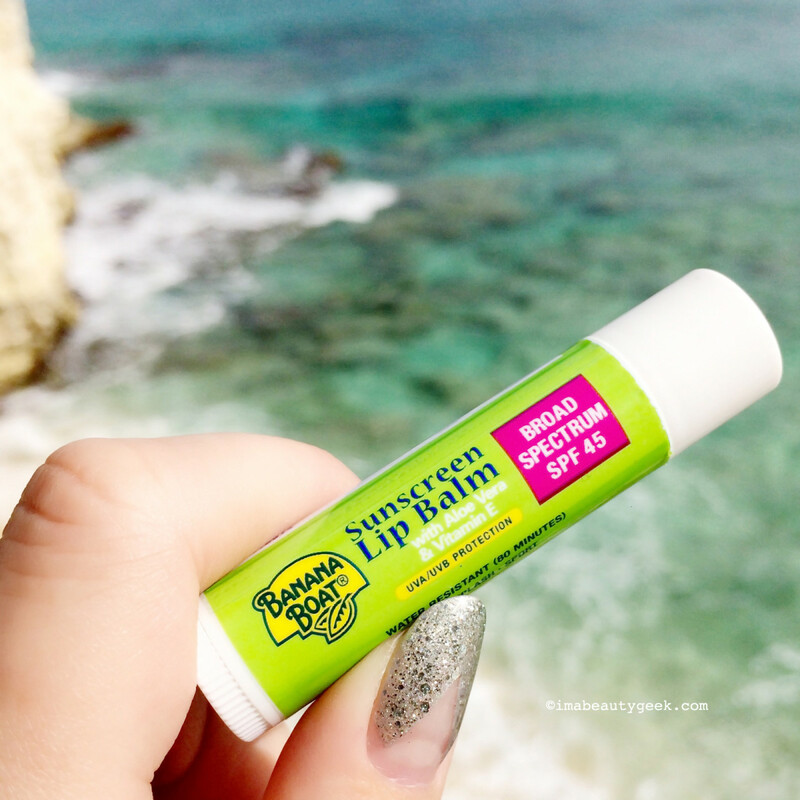 For a stick balm, the Banana Boat SPF 45 salve glides on surprisingly smoothly, without tugging, and feels much less waxy on lips than I expected. The formula isn&apos;t especially moisturizing, but it did prevent my lips from drying out. I&apos;d buy it again because it&apos;s an SPF 45, and the price ($3.49 CAd at Rexall, $2.49 CAd at londondrugs.com and $3.24 at drugstore.com) says hey, buy two why doncha? Banana Boat also makes an SPF 50 sport lip balm. I&apos;d buy that too. If you&apos;d prefer a paraben-free balm, though, this isn&apos;t for you. But maybe you like a waxy salve? Our Liza (Leeza) Herz and I still occasionally get into it over waxy and non-waxy lip balms. For her, the waxier the better. She likes that texture, finds it reassuring. I want to hashtag "weird," and maybe "mystified." I like formulas that effortlessly blanket the lips in a soothing veil of moisture and protection. This Nivea Sun SPF 30 lip balm doesn&apos;t qualify. 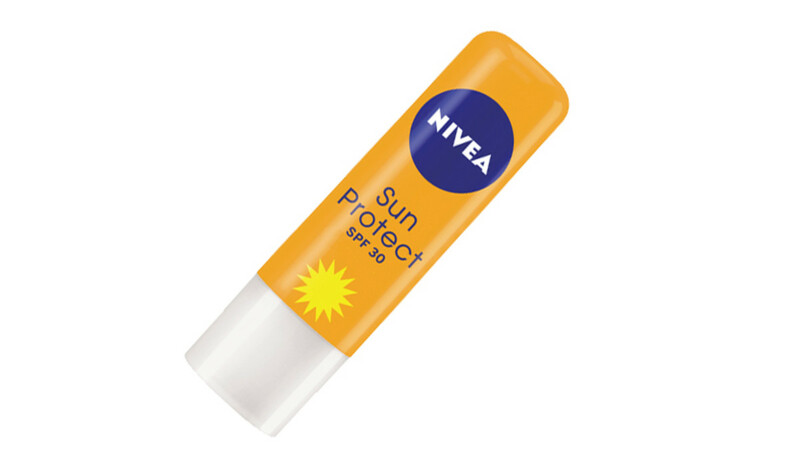 Nivea Sun SPF 30 lip balm ingredients Active: Octinoxate 7.5%, Octocrylene 7.5%, Oxybenzone 3.5%, Titanium Dioxide 2.5%. Inactive: Microcrystalline Wax/Cire microcristalline, Octyldodecanol, Ricinus Communis (Castor) Seed Oil, Cetyl Palmitate, Hydrogenated Polydecene, Myristyl Myristate, Cetearyl Alcohol, Bis-Diglyceryl Polyacyladipate-2, C20-40 Alkyl Stearate, Copernicia Cerifera (Carnauba) Wax/Cire de carnauba , Butyrospermum Parkii (Shea Butter), Simmondsia Chinensis (Jojoba) Seed Oil, Tocopheryl Acetate, Helianthus Annuus (Sunflower) Seed Extract, Beeswax/Cire d’abeille, Propylene Glycol, BHT, Fragrance/Parfum, Yellow 6 Lake, Yellow 5 Lake. Yes, that&apos;s a real iguana in the background. He&apos;s a St. Maarten native who calls the Cupecoy cliffs home. I called him Sonny, which I like to think is the boy version of Sunny. Oooh! 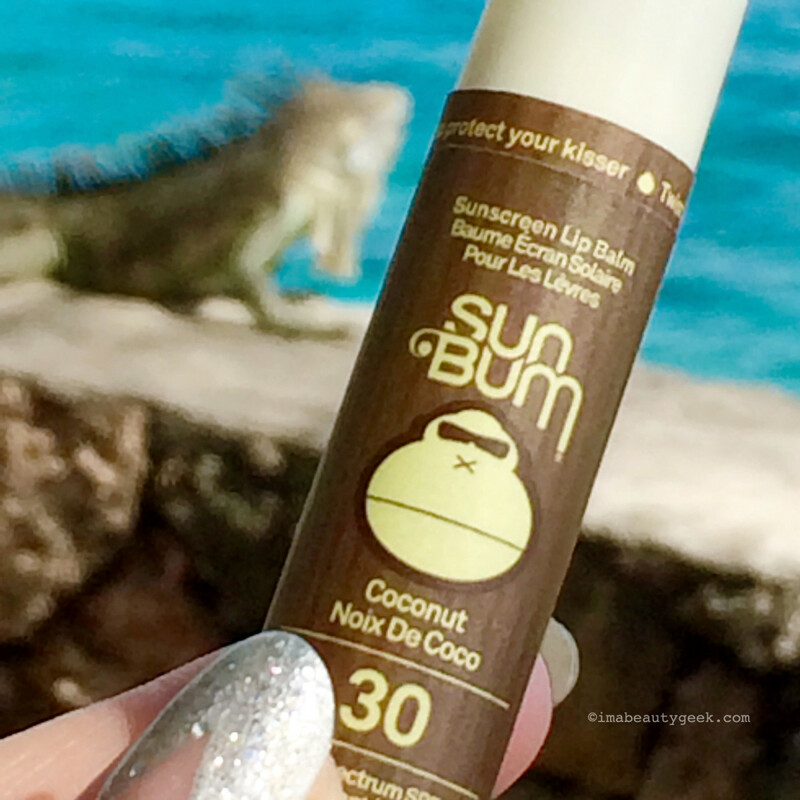 That was my first thought when I tried Sun Bum SPF 30 lip balm in Coconut ($4.99 CAd at Shoppers Drug Mart and $3.99 USd at ulta.com). The smooth, emollient texture melts over lips on application. I wish it were a bit stickier though, to make it last longer on lips. 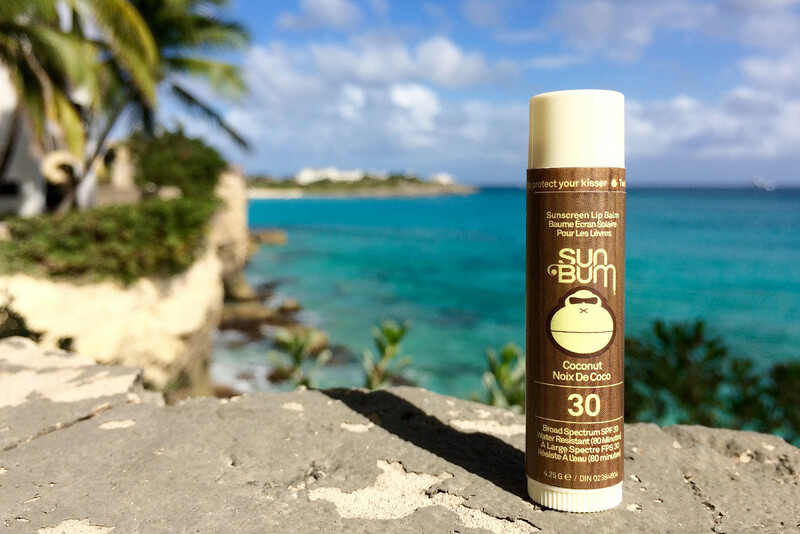 Sun Bum SPF 30 lip balm ingredients Active: Avobenzone 2.00%, Homosalate 15.00%, Octisalate 5.00%, Octinoxate 7.50%. Inactive: Adipic Acid, Algae Extract, Aloe Barbadensis Leaf Extract, Ascorbic Acid, Bht, Calendula Officinalis (calendula) Extract, Camellia Sinensis (green Tea) Leaf Extract, Caprylic / Capric Triglyceride, Cetyl Alcohol, Citrus Grandis (grapefruit) Extract, Citrus Medica Limonum (lemon) Extract, Cucumis Sativus (cucumber) Extract, Cyclomethicone, Diethylene Glycol, Diisobutyl Adipate, Dimethicone, Equisetum Arvense (horsetail) Extract, Ethylhexyl Palmitate, Fragrance, Gingko Biloba Extract, Glycerin Crosspolymer, Isostearyl Linoleate, Oleoresin Rosmarinus Officinalis (rosemary) Extract, Ozokerite, Panax Ginseng Root Extract, Peg-8, Propylparaben, Punica Granatum (pomegranate) Extract, Retinyl Palmitate, Salix Alba (willow) Bark Extract, Salvia Officinalis (sage) Extract, Silica, Sodium Saccharin, Theobroma Cacao (cocoa) Seed Butter, Tocopheryl Acetate. 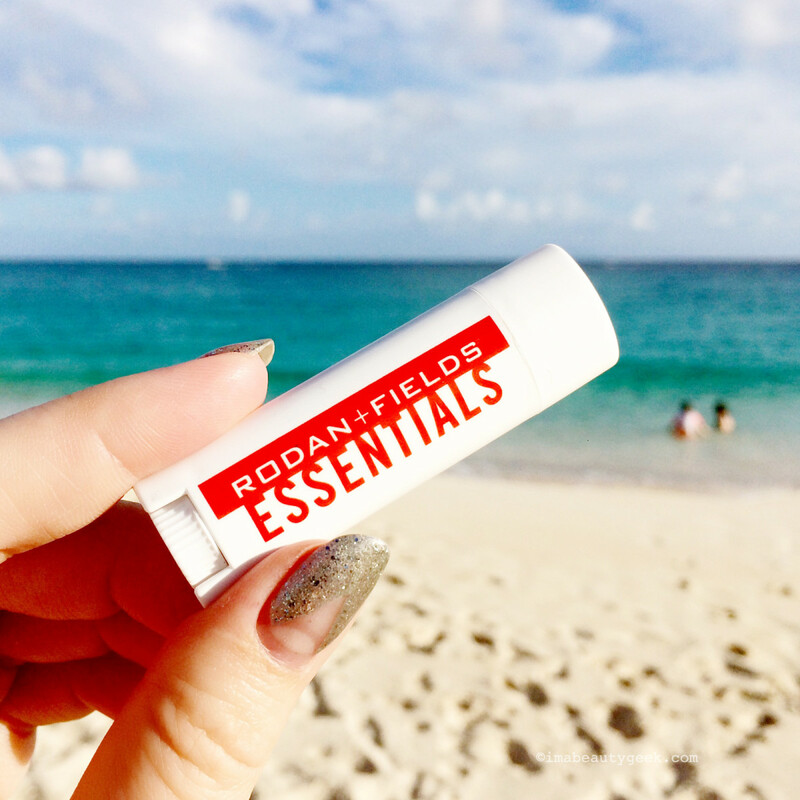 The price tag for this Rodan and Fields Essentials SPF 25 lip balm is $21 CAd and $16 USd because you get two in a package. Sure, it works out to $11 each in Canada, but in the US, you&apos;re at $8 per. 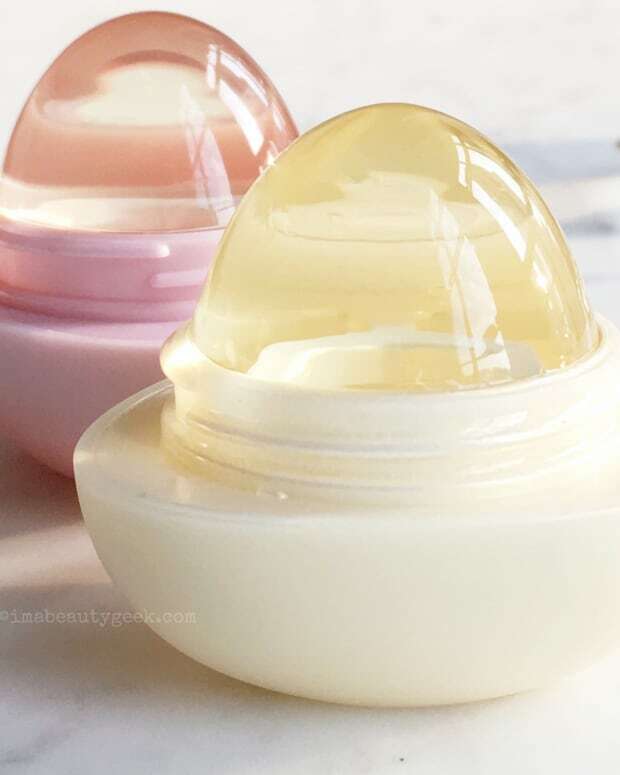 You&apos;ll find this lip balm worth the price if you like a passion-fruity scent, a texture that indicates a high-level of natural oils, such as avocado, jojoba and sunflower, and a peptide hit for a little extra anti-aging service. At SPF 25, it comes in at a slightly lower level of protection than the others featured here, but it&apos;s worth mentioning because my 10-year-old niece Lauren really digs it. (As you know, the best SPF, lip balm or otherwise, is one you like and one you&apos;ll use.) I like it too, but would more readily re-up on others in this post partly due to accessibility (a quick nip into a drugstore is my speed). rodan + fields essentials spf 25 ingredients Actives: Avobenzone 2.5%, Homosalate 8%, Octisalate 5%, Octocrylene 2.2% Inactives: Beeswax, Hydrogenated Avocado Oil, Butyrospermum Parkii (Shea Butter), Persea Gratissima (Avocado) Oil, Simmondsia Chinensis (Jojoba) Seed Oil, Acacia Decurrens/Jojoba/Sunflower Seed Wax/Polyglyceryl-3 Esters, Sunflower (Helianthus Annuus) Seed Oil Unsaponifiables, Dimethicone, Fragrance, Ethylhexyl Palmitate, Hydrogenated Polydecene, Dunaliella Salina Extract, Palmitoyl Oligopeptide, Tetrahexyldecyl Ascorbate, Tocopheryl Acetate, Retinyl Palmitate, Melaleuca Alternifolia (Tea Tree) Leaf Oil, Tribehenin, Sorbitan Isostearate. I&apos;ve included some others in the shoppity shop-shop widget below. If you&apos;ve tried – or you eventually try – any of those, please let me know how they rate!